My friend spoke these words as if they were a cliché, something that had been repeated a thousand times by a thousand people. But I had never heard the expression and I didn’t know the Shrimp Corner. For me, it had escaped the notoriety of, say, Pat’s King of Steaks on Passyunk Avenue in South Philadelphia. I knew there was always a line at Pat’s. I’d waited in it at 3 a.m. Pat’s was in an Italian neighborhood and I felt comfortable there. People went there after Phillies games. The very different Shrimp Corner is in North Philadelphia, a poor, high-crime area. I’m sure it is considered home to many, but to those in the suburbs, sadly, it was simply a place to avoid. 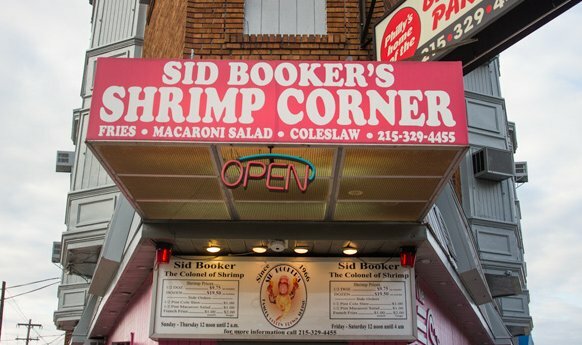 Formally known as Sid Booker’s Shrimp Corner, the takeout eatery opened in 1966. As the name suggests, it juts out on a block that forms an acute angle. To order, you walk up to a window made of bulletproof glass. The food is not cheap. 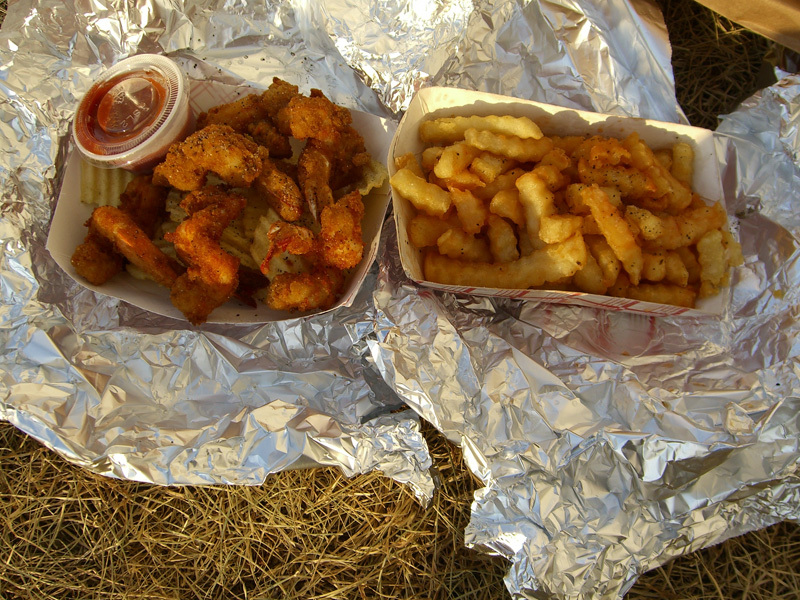 A dozen batter-fried shrimp with fries costs about $20. 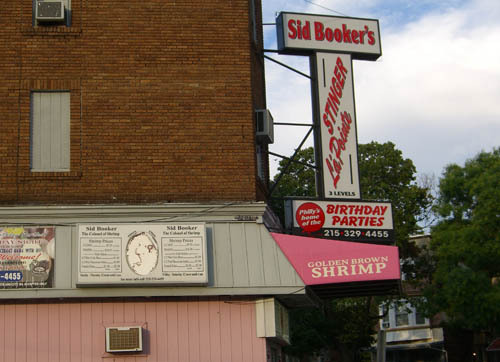 The rest of the building, painted pink, houses Sid Booker’s Stinger Lounge. Because of the Shrimp Corner, I thought about my old girlfriend this month. As circumstance would have it, I drove by Broad and Belfield three times in the last four weeks. Each time, there was no line at the Shrimp Corner. When I first saw the Shrimp Corner more than a couple decades ago, North Philadelphia may have been at its lowest. It was in great deterioration. I know so little of these neighborhoods, but I do recall how the homes and small business were sinfully neglected. Some were actually falling down. On Broad Street, the main thoroughfare, there wasn’t a fresh coat of paint to be seen. I doubt a nickel had been invested in the place. Then, about the time when real estate prices took off and business loans were easier to get, new shopping centers went up. Franchises like CVS settled in, as did more fast food restaurants. The regional transportation authority, SEPTA, even brought in new buses. Meanwhile, a so-so college in the heart of North Philadelphia was expanding. An incredible number of well-designed, multi-story buildings appeared on Broad Street — for miles. Temple University, once a commuter college for the working class, had become a residential college that was attracting a new generation of students seeking an urban experience. Houses were fixed up and rented to students. New housing was constructed. If a Temple student was stupid enough to start selling drugs, he might get busted up in his nice apartment and have his stash and cash stolen. There would be episodes like when three neighborhood girls went around smashing bricks in the faces of female students. But overall, things really seemed to improve. So why isn’t there a line at the Shrimp Corner? I don’t know, but I do have a suggestion. Recently there have been a series of Flash Mobs at old, nearly forgotten, Eleanor Rigby/Father McKenzie type cathedrals. Calling themselves “Mass” Mobs, Catholics are trying to revive these still elegant structures by using social media to fill pews. If its true that the Shrimp Corner is not the draw it once was, wouldn’t it be fun to organize a Flash Mob – call it a “Flash Fry” — and send the line at the window down the block and all the way to Temple? Sid sure would go for the idea. Maybe he could donate some of the profits to fix up North Philly’s Uptown Theater, which has been trying and trying and trying to come back but can’t. I have no deep emotional connection to any of this, so it’s not for me to organize an event. Still, I’d love to see North Philadelphia attract more investment and make Broad Street once again a great and grand boulevard.